It is believed that The 'M-T Express' series was created in an effort to provide the smaller retailers with a cost-effective product in order to compete with the Special Sets assembled specifically for the large department stores and home shopping / mail order companies; without the larger stores 'having their noses put out of joint'. It is most likely that the sets and individual models were marketed through the Roland G. Hornby branch of the company which had been set up specifically to service the smaller shops and retail outlets. The freight cars, battery controller and station all date from 1967, when batches of 2,500 of each model were manufactured in Margate, UK and exported bulk-packed for inclusion in Canadian assembled battery-powered Starter Sets. New information about the M-T Express Starter Sets has now come to light (November 2015) and it is now possible to state, with some certainty, the actual contents of these extremely elusive sets. This issued set was composed of the red R.253 Yard Switcher Locomotive (Dock Authority), the following three freight cars with 'M-T Express' clear adhesive labels - black R.219NP Brick Wagon, brown R.334NP Track Cleaning Car (without metal track cleaning insert), orange R.115NP Caboose - small oval of track with an outside siding (R.483 1st Radius Double Curve x8, R.481 Straight, R.491 Right-hand Point, R.486 2nd Radius Curve, R.480 Double Straight, R.488 Uncoupling Ramp, R.494 Buffer Stop, R.487 Power Connecting Clip) and RP.40C Battery Connector. It is believed that the M-T Express Sets also included a small Island Platform (Station) Set. This was produced using the tools for the Tri-ang TT scale Island Platform. 2,500 of these cheap stations were manufactured in Margate in 1967 and sent bulk-packed to Canada for inclusion in starter sets. The stations consisted of a T.20C Platform Unit, T.26C Platform Canopy Unit and 2x T.39C Platform Ramps. It is not known if they were made in the same colours as those used for British stations. Very few of the freight car models have survived with the 'M-T' and 'Express' clear adhesive labels still attached; due to the adhesive gum drying and the labels falling off. 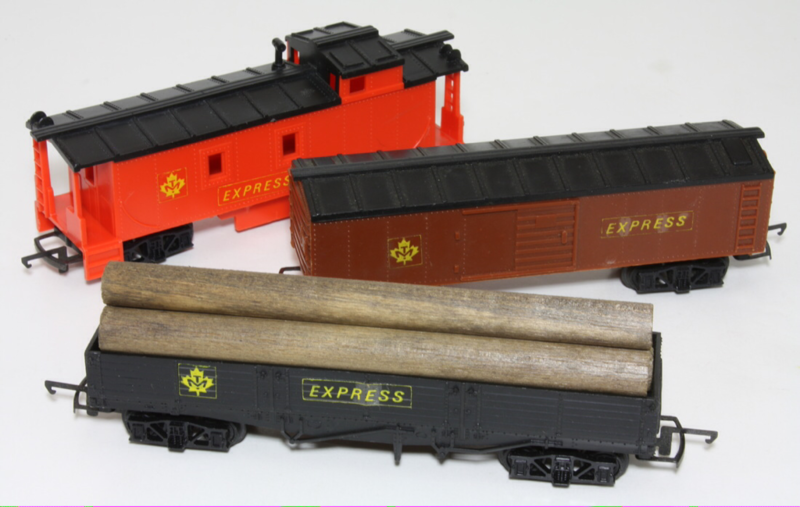 Although potentially 2,500 of these sets could have been produced this is most unlikely since it is known that some of the freight cars were boxed and sold individually. No details are currently known about how the set was packaged other than that the packaging was most probably manufactured locally in Canada.